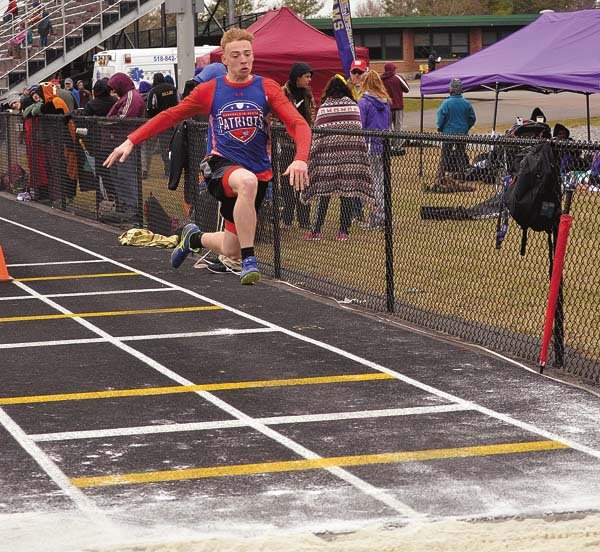 FONDA — Local track and field athletes battled cold weather and winds as well as fellow competitors Saturday at the first local track and field invitational of the year, the Bi-County/Ken Smith Invitational at Fonda-Fultonville High School. Amsterdam’s Gabby Stanavich and Canajoharie’s Andrew Yacobucci were named the Female and Male Outstanding Athletes of the Meet. Stanavich established a new meet record with her victory in the 100-meter high hurdles with a time of 14.8. She also won the 400-meter intermediate hurdles with a time of 69.7 and ran legs on the Lady Rams’ victorious 400- and 1,600 meter relay teams. Yacobucci won the 800-meter run with a time of 2:12.9, the high jump with a height of 5-10, ran a leg on the Cougars victorious 1,600-meter relay team and finished second in the 1,600-meter run with his time of 5:00.9. Fonda-Fultonville’s Brittany Castelluccio was selected the Female Outstanding Field Performer, while Broadalbin-Perth’s Sean Meher won the honor on the boys side. 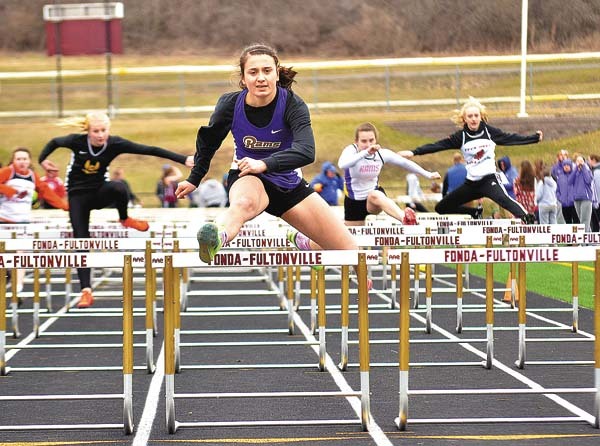 Castelluccio won the long jump with a jump of 16-09.0, the triple jump with a leap of 34-10 and was second in the 100-meter dash with her time of 13.1 and ran a leg on Fonda-Fultonville’s third-place finishing 1,600-meter relay team. Meher won the triple jump with a leap of 40-02.5, the long jump with a jump of 19-04 and placed second in the high jump, clearing the bar at 5-08. Mayfield-Northville’s Madison Relyea was named the top Female Track Performer, while Amsterdam’s Marcos Santiago received the honor for the boys. relyea topped the field in the 1,500-meter run with her time of 5:14.5 and the 800 meters with a time of 2:32.7 and ran a leg on the second-place 3,200-meter relay team. 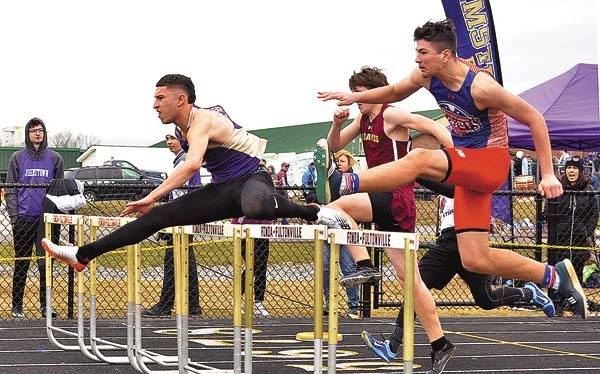 Santiago won the 100-meter high hurdles with a time of 15.3 and posted a time of 54.9 in his victory in the 400-meter dash. He also ran a leg on the second-place finishing 1,600-meter relay team. 3,000: 1. Olivia Lazarou (Am), 11:13.1; 2. Haley Clear (FF), 12:13.6; 3. Eliza Cechnicki (FP-OESJ); 4. Samantha Murphy (BP), 12:39.2; 5. Fianna Halloran (M-N), 12:39.5; 6. Hailie LaPratt (FF), 12:54.6. 100: 1. Charli Beekman (Am), 12.7; 2. Brittany Castelluccio (FF), 13.1; 3. Jenna Thompson (J), 13.5; 4. Autumn Todd (FF), 13.8; 5. Taylor Krawczyk (Am), 13.8; 5. Rhea Winter (Glov), 13.8. 100 HH: 1. Gabby Stanavich (Am), 14.8; 2. Emma Rhodes (FF), 17.0; 3. Emily Mayer (Can), 17.8; 4. Alyson Shirley (FF), 18.1; 5. Ava Tyler (BP), 18.5; 6. Emilia Vardai-Davidson (FF), 18.7. 200: 1. Brenda Santana (Am), 26.4; 2. Emilia Vardai-Davidson (FF), 28.1; 3. Taylor Krawczyk (Am), 28.6; 4. Rhea Winter (Glov), 29.9; 5. Taya Yacobucci (Can), 29.9; 6. Keisha Rose (Am), 29.9. 3,200 Relay: 1. Amsterdam (Kayla Sondrup, Skylar Grybos, Brook Marshall, Gabby Feliciano), 11:14.5; 2. Mayfield-Northville 11:31.8; 3. Johnstown 11:37.9; 4. Fonda-Fultonville 11:57.7. 1,500: 1. Madison Relyea (M-N), 5:14.5; 2. Skylar Grybos (Am), 5:53.2; 3. Haley Clear (FF), 5:55.1; 4. Gabby Feliciano (Am), 5:55.5; 5. Rose Barnhart (BP), 5:55.9; 6. Eliza Cechnicki (FP-OESJ), 6:09.3. 400 Relay: 1. Amsterdam (Emma Gomez, Brenda Santana, Gabby Stanavich, Charli Beekman), 52.6; 2. Broadalbin-Perth 58.2; 3. Fonda-Fultonville 59.1; 4. Johnstown 1:00.1; 5. Gloversville 1:01.1; 6. Fort Plain-Oppenheim-Ephratah/St. Johnsville 1:03.0. 400: 1. Lauren Santiago (Am), 1:02.5; 2. Emily Abrams (FP-OESJ), 1:07.9; 3. Taya Yacobucci (Can), 1:09.3; 4. Gabby Stanavich (Am), 1:09.7; 5. Meghan Dingman (Can), 1:09.8; 6. Lauryn Wilson (J), 1:10.2. 400 IH: 1. Gabby Stanavich (Am), 1:09.7; 2. Abby Gottung (J), 1:12.1; 3. Emma Rhodes (FF), 1:16.5; 4. Gabrielle Larsen (BP), 1:19.5; 5. Emily mayer (Can), 1:19.5; 6. Samantha Kaminski (Am), 1:22.5. 800: 1. Madison Relyea (M-N), 2:32.7; 2. Kayla Sondrup (Am), 2:50.6; 3. Savannah Bell (FF), 2:53.0; 4. Brook Marshall (Am), 2:55.6; 5. Katie Romano (J), 2:59.7; 6. Madison Richardson (FP-OESJ), 3:00.2. 2,000 Steeplechase: 1. Gabrielle Larsen (BP), 8:37.6; 2. Katie Romano (J) 9:45.9; 3. Brooke Grace (J), 10:15.6; 4. Jayden Mundell (FF), 10:55.2. 1,600 Relay: 1. Amsterdam, 4:22.4; 2. Johnstown 4:43.8; 3. Fonda-Fultonville 4:44.7; 5. Fort Plain-Oppenheim-Ephratah/St. Johnsville 5:14.5. Shot Put: Rhyonn Ford (FP-OESJ), 28-04.0; 2. Katelyn Davis (BP), 25-08.75; 3. Alexz Lathers (Can), 25-00.75; 4. Meghan MacDougall (FF), 25-00.0; 5. Ivy Dutcher (Glov), 24-03.0; 6. Brenna Wooster (Glov), 23-08.0. Discus: 1. Sam Kent (M-N), 87-00; 2. Rhyonn Ford (FP-OESJ), 80-06; 3. Krystal McSpirit (FF), 79-06; 4. Meaghan MacDougall (FF), 76-06; 5. Katelyn Davis (BP), 72-03; 6. Olivia Hopkins (Can), 69-07. Long Jump: 1. Brittany Castelluccio (FF), 16-09.0; 2. Charli Beekman (Am), 15-04.0; 3. Lauren Santiago (Am), 15-01.0; 5. Mikayla Myers (M-N), 14-09.5; 5. Emma Gomez (Am), 14-05.0; 6. Gabby Palmer (J), 14-04.0. Triple Jump: 1. Brittany Castelluccio (FF), 34-10.0; 2. Emilia Vardai-Davidson (FF), 32-06.0; 3. Hailey Parrotti (BP), 32-03.5; 4. Mikayla Myers (M-N), 30-10.25; 5. Emma Gomez (Am), 30-06.5; 6. Taya Yacobucci (Can), 28-11.0. High Jump: 1. Jackie Stanavich (Am), 5-00.0; 2. Kayla Sondrup (Am), 4-08.0; 3. Meghan Dingman (Can), 4-06.0; 4. Alyson Shirley (FF), 4-06.0; 5. Ava Tyler (BP), 4-04.0; 6. Emily Miles (J), 4-04.0. Pole Vault: 1. Ava Tyler (BP), 8-06.0; 2. Jackie Stanavich (Am), 7-06.0; 3. Abigail Smith (Can), 7-00.0; 4. Ryleigh Hesch (FF), 6-06.0. 3,200: 1. Shane Viscosi (FF), 10:59.0; 2. Micah Smith (BP), 11:34.4; 3. Daniel Bublack (Am) 11:53.5; 4. Ty Perue (Can), 11:55.5; 5. Jackson Rogers (BP), 11:56.2; 6. Armand Root (FP-OESJ), 12:04.8. 100: 1. Ivan Roberts (BP), 11.3; 2. Luis Rodriguez (Am), 11.6; 3. Mekhi Lanier (FP-OESJ), 12.0; 4. Patrick Raldiris (Glov), 12.0; 4. Trey Stover (J), 12.0; 6. Robert Martinez (Am), 12.0. 110 HH: 1. Marcos Santiago (Am), 15.3; 2. Andrew Towse (Can), 15.8; 3. Andrew Ferguson (Can), 15.8; 54. Liam Viscosi (FF), 17.2; 5. Luke Sunderland (Can), 17.6; 6. Niko Mancini (BP), 17.9. 200: 1. Ivan Robert (BP), 23.3; 2. Marco Rivera (Am), 24.1; 3. Patrick Raldiris (Glov), 25.0; 4. Zydain Jackson (BP), 25.5; 5. Mekhi Lanier (FP-OESJ), 25.6. 3,200 Relay: 1. Amsterdam (Chaun Ramos, Travor Dzikowicz, Antonio Reyes, Daniel Bublak), 9:28.9; 2. Fonda-Fultonville 9:32.4; 3. Johnstown 9:42.3; 4. Mayfield-Northville 10:11.0; 5. Broadalbin-Perth 10:38.0; 6. Fort Plain-Oppenheim-Ephratah/St. Johnsville 11:57.7. 1,600: 1. Trevor Dzikowicz (Am), 4:57.7; 2. Andrew Yacobucci (Can), 5:00.9; 3. A.J. Christopher (BP), 5:03.9; 4. Skyler Reed (Glov), 5:04.3; 5. Sebastian Mills (J), 5:05.0; 6. Riley Lake (Glov), 5:20.4. 400 Relay: 1. Johnstown (Zach Ropeter, Adam Wilson, Evan White, Trey Stover), 50.3; 2. Amsterdam 50.3; 3. Broadalbin-Perth 50.5; 4. Fort Plain-Oppenheim-Ephratah/St. Johnsville 52.6; 5. Fonda-Fultonville 52.6. 400: 1. Marcos Santiago (Am), 54.9; 2. Logan Arduini (Can), 56.7; 3. Trevon Joyner (Am), 59.5; 4. Austin Ferrara (Can), 1:00.2; 5. Christian Pearce (FF), 1:01.7; 6. Nolan Hayes (J), 1:03.6. 400 IH: 1. Andrew Towse (Can), 1:02.4; 2. Andrew Ferguson (Can), 1:03.8; 3. Liam Viscosi (FF), 1:04.1; 4. Marcus Johnson (Can), 1:06.3; 5. Jonathon Simmins (BP), 1:11.8; 6. Justin Ferrara (J), 1:12.6. 800: 1. Andrew Yacobucci (Can), 2:12.9; 2. Aidan Zenzen (FF), 2:18.1; 3. Dylan Bumpus (M-N), 2:21.2; 4. A.J. Chrstopher (BP), 2:21.2; 5. Skyler Reed (Glov), 2:23.6; 6. Antonio Reyes (Am), 2:23.7. 3,000 Steeplechase: 1. Skyler Reed (Glov), 11:34.5; 2. Devin Becker (BP), 12:24.1; 3. Aidan Zenzen (FF), 12:39.9; 4. A.J. Sullivan (Can), 12:47.3; 5. Shane Viscosi (FF), 12:53.5; 6. August D’Amore (J), 12:58.0. 1,600 Relay: 1. Canajoharie 3:51.9; 2. Amsterdam 3:53.7; 3. Johnstown 4:10.2; 4. Fonda-Fultonville 4:22.3; 5. Fort Plain-Oppenheim-Ephratah/St. Johnsville 4:26.2; 6. Broadalbin-Perth 4:38.9. Shot Put: 1. John Coddington (BP), 42-11.25; 2. Chris Yarush (FF), 42-10; 3. Brady VanAernam (J), 40-09.0; 4. Aidan DeJong (BP), 40-01.5; Hunter Logan (FP-OESJ), 38-08.75; 6. Riley Savoie (J), 36-09.0. Discus: 1. Tommy Lizio (J), 135-09; 2. Aidan DeJong (BP), 130-06; 3. Marcos Viera (BP), 119-08; 4. Brady VanAernam (J), 107-04; 5. Chris Yarush (FF), 106-04; 6. John Coddington (BP), 103.08. Long Jump: 1. 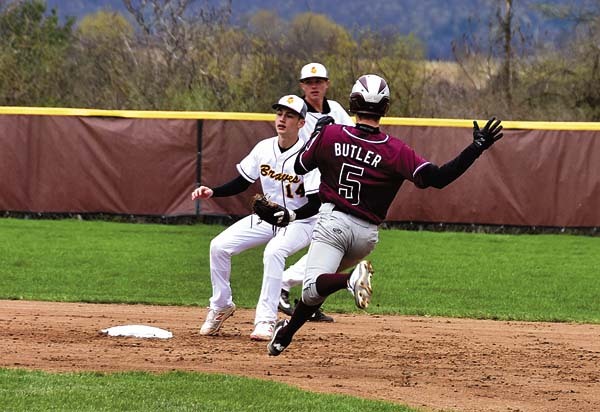 Sean Meher (BP), 19-04.0; 2. Marco Rivera (Am), 19-02.75; 3. Angel Sanchez (Am), 17-11.0; 4. Jeff Shlomovich (BP), 17-05.0; 5. Nolen Neznek (BP), 16-08.0; 6. Christian Pearce (FF), 16-05.75. Triple Jump: 1. Sean Meher (BP), 40-02.50; 2. Marcus Johnson (Can), 39-00.75; 3. Marco Rivera (Am), 36-01.0; 4. Evan Lehr (M-N), 36-00.25; 5. Niko Mancini (BP), 35-10.0; 6. Jeff Shlomovich (BP), 35-08.25. High Jump: 1. Andrew Yacobucci (Can), 5-10.0; 2. Sean Meher (BP), 5-08.0; 3. Joey Matthews (J), 5-04.0; 4. Stan Kwiatkowski (Can), 5-04.0; 5. Raymond Strauser (Glov), 5-02.0; 6. Niko Mancini (BP), 5-02.0. Pole Vault: 1. Jeff Shlomovich (BP), 11-00.0; 2. Dylan Bumpus (M-N), 11-00.0; 3. Sebastian Mills (J), 9-06.0; 4. Chaun Ramos (Am), 9-06.0; 5. Anthony Gatto (FF), 9-00.0; 6. Louis Calbet (FP-OESJ), 8-06.0.